Supernova Blast Bonanza in Nearby Galaxy The nearby dwarf galaxy NGC 1569 is a hotbed of vigorous star birth activity which blows huge bubbles that riddle the main body of the galaxy. The galaxy's "star factories" are also manufacturing brilliant blue star clusters. This galaxy had a sudden onset of star birth about 25 million years ago, which subsided about the time the very earliest human ancestors appeared on Earth. Space Phenomenon Imitates Art in Universe's Version of van Gogh Painting This image resembling Vincent van Gogh's painting, "Starry Night," is Hubble's latest view of an expanding halo of light around a distant star, named V838 Monocerotis (V838 Mon). This Hubble image was obtained with the Advanced Camera for Surveys on February 8, 2004. The illumination of interstellar dust comes from the red supergiant star at the middle of the image, which gave off a flashbulb-like pulse of light two years ago. V838 Mon is located about 20,000 light-years away from Earth in the direction of the constellation Monoceros, placing the star at the outer edge of our Milky Way galaxy. Ghost Nebula This ghostly apparition is actually an interstellar cloud caught in the process of destruction by strong radiation from a nearby hot star. This haunting picture, snapped by the Hubble telescope, shows a cloud illuminated by light from the bright star Merope. Located in the Pleiades star cluster, the cloud is called IC 349 or Barnard's Merope Nebula. Lunar Footprint Buzz made this footprint on a pristine surface so that he could then photograph it for study by soil mechanics experts. The position of the sun in our Galaxy, the Milky Way, gives us an opportunity to study the evolution of the stars in detail and to investigate the formation and evolution of galaxies. The Milky Way is a typical spiral galaxy. It has recently been discovered that it is also barred in the middle, as seen in other spiral galaxies and for example in the galaxy M100 (below). The solar system is located in the plane near the edge of the disk, therefore we see the disk edge on. With the naked eye the disk of our Galaxy appears as a milky band made up of a myriad of stars and interstellar clouds. M100 galaxy. Photographed by Hubble Space Telescope (Credit NASA). 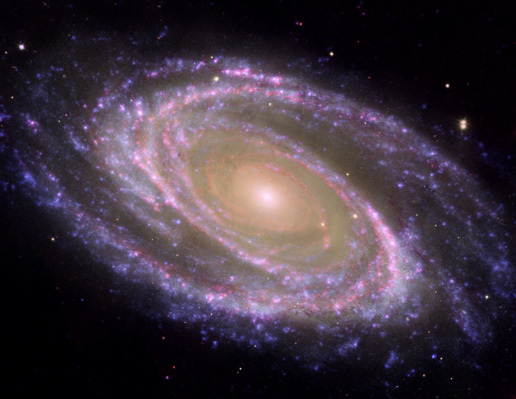 This spiral galaxy, similar to our Milky Way, is to approximately 60 million light-years, in the Virgo Cluster. In the spiral arms, stars are born. They are very hot and give a blue color. In the central part of the galaxy, the white light comes from stars hurdy-gurdies. This spiral galaxy, similar to our own Galaxy, is 60 million light-years from us, in the Virgo galaxy cluster. The spiral arms are filled with interstellar clouds of gas and dust, and young stars. At birth these massive stars are hot and blue, which gives the observed blue colour to the arms. In the central part of the Galaxy, stars were born earlier in the history of the galaxy. Hence they are are now older, redder and cooler than the blue stars. Many different kinds of observation can be made on stars using modern telescopes. We actually measure their luminosity, colour in various part of the spectrum, temperature, gravity, abundance of various elements, motions and sometimes also their age and mass. With this data for a large number of stars one can try to deduce how the Galaxy has been forming stars, how old it is as well as how it has evolved. Finally we emphasise an overall scheme of formation and evolution for all galaxies. One way to further our understanding of Galactic structure and evolution is to make a mathematical model. We have used this method and so have built a Galaxy model which allows us to simulate the number of stars and their observational properties expected in any given region of the sky, by using a set of theoretical assumptions and a scenario of Galactic evolution. The Besançon model of the Galaxy is a powerful tool dedicated to the understanding of how the properties and statistics of the stars are related to the history of our Galaxy. Astronomy only plays a tangential role in this picture… you can see stars in the sky, and the observatory is pretty obvious. But it’s the terrestrial drama that steals the show. Jupiter is fantastically massive, and its fearsome gravity holds thrall over a retinue of moons that might otherwise be called planets in their on right. By far, the most interesting of its family are the moons Europa and Io. Europa is an ice world, covered in a thick sheet of ice that might reach down to depths of over perhaps several kilometers. It’s nearly a dead certainty that underneath that forbidding icecap is an ocean of water, kept liquid from energy input by gravitational stress as Europa passes by her sister moons. Of all the real estate in the solar system, many astronomers have their money on Europa as the best place to look for alien life. Io, on the other hand, is perhaps the worst place for life. It has an incredibly high sulfur content, for one thing. For another, the same gravitational heating that keeps Europa’s ocean liquid also keeps Io’s interior molten, but it gives the moon a cosmic case of indigestion. Io is wracked with volcanoes. They are almost constantly erupting, spewing molten sulfur over a kilometer high in the low gravity, and plumes of dust and gas blast hundreds of kilometers off the surface. This activity was first discovered when the Voyager 1 probe passed the moon in 1979, but subsequent space probes have gotten even more detailed images. When the New Horizons Pluto probe passed Jupiter in March 2007 for a gravity boost, it snapped a beautiful picture of the sisters. Europa is the crescent on the lower left, and obviously is the one on the upper right. The plume you see is from the volcano Tvashtar, which has been active for quite some time now. If you look right at the bottom of the plume, you can see molten sulfur glowing red. Two other volcanoes appear to be making some noise as well. While they appear to be close together, the two moons were actually nearly 800,000 kilometers apart when this picture was taken; Io was on one side of Jupiter and Europa on the other, but from the spacecraft’s perspective they were next to each other in the sky. This picture is actually a composite of two images; one was greyscale and had high resolution, and the other was in color but had lower resolution. By merging the two, we can see more details than we could from the color image alone, and we get the benefit of having the colors enhance the scene. When I first saw this image, I knew right away the two moons were not close together at all. My secret? I saw that the dark side of Europa was truly dark, but Io’s dark side was lighter. That meant that Io was positioned such that Jupiter was illuminating its otherwise dark half, while Europa must have been on the other side of Jupiter, where it was dark. Sometimes, you can tell a lot just by looking at a image and picturing the geometry in your head. I have long been a fan of Davide De Martin from Sky Factory. He takes images from professional observatories and stitches them together to make images of indescribable beauty, elegance, and wonder. His work is, simply, breathtaking. This image shows the devastation wrought when a star explodes. The Vela Supernova Remnant formed when a massive star 800 light years away blew up 11,000 years ago. Expanding at a ferocious velocity, it is now 8 degrees across in the sky — 16 times the apparent width of the Moon, and about the size of your outstretched fist! David’s mosaic shows a stunning amount of detail, tracing the variety of shapes and patterns the expanding gas makes as it slams into the interstellar junk floating around it. And if that’s not enough, the full-size image he has on his site is well over a billion pixels in size. Think about that the next time you brag about your digital camera.Let’s start by asking a simple question: how many stars are there in our galaxy? We know the answer is roughly 400 billion stars, even though there may be, realistically, as few as half or as many as double this number. What’s interesting is that about 90% of all of the stars in the Milky Way are relatively cool and small, like our Sun (types F, G, K, and M below). Most are a little smaller (something like 80% are only a fraction of the Sun’s mass), but there are plenty of stars that are very comparable to the Sun in mass, brightness, and composition. This means that of the 400 billion stars in our galaxy, about 10% of them are similar enough to our Sun that they could reasonably have planets around them that support life. This means our galaxy has about 40 billion chances to have another planet like Earth in it. So the next step, now that we know how many good stars there are, is to ask how many of them have planets that could support life on them? It turns out, as far as we can tell, that most stars actually do have planets orbiting them. Although we’ve only discovered about 300 planets orbiting other stars at last count, the results are consistent with the majority of stars having planets orbiting them. But we have found rocky planets, and we have found planets around inhabitable stars, and they all seem abundant. The question is how many planets, in each Solar System, will be within what we call the habitable zone, or in the region around the star where they won’t freeze or be cooked? Well, our Solar System had, at its outset, three chances: Venus, Earth, and Mars. Currently, Earth is the only one with life, but Venus and Mars may both have had it in the past. You can read more about habitable zones here, but the overall lesson is that it’s very easy to have a rocky planet in the area around a star where, at some point, you can have life, such as Mars or Venus. It’s more difficult to have a planet like Earth, where the temperatures have been just right to allow life to form and evolve for a continuous period of over 4 billion years. As far as I can tell, to have a rocky planet that falls somewhere in the habitable zone at some point happens frequently: maybe 5% of the time according to simulations. On the other hand, to have something Earth-like, which is the right mass to have a living core and hence be volcanically active, has a magnetic field, has a thick (but not too thick) atmosphere, and is in the continuously habitable zone, happens far less frequently. I don’t know the geophysics to predict volcanic activity, rotation speed, and magnetic fields, but I can predict the rest: we get a planet of the right mass and right atmosphere in the perfect “goldilocks” location maybe 0.01% of the time. Still, this gives us a lot of chances. Out of the 40 billion roughly Sun-like stars, this means about 2 billion have rocky planets that could support life at one time, and there are about 4 million planets in the galaxy with favorable masses and locations as compared to Earth. If we want to be conservative, we can say that maybe only 1 in 4 of those has the right magnetic field and rotation to allow life to evolve, so that leaves us with 1 million good-looking planets for continuous life in the Galaxy. In 1996 and 1997 we saw comet Hyakutake, and comet Hale-Bopp. Hale-Bopp was one of the brightest comets ever seen from Earth. Comet Linear was discovered in 1999 and made its closest approach of the Sun in July 2000. The Stardust spacecraft flew by Comet Wild 2 in January 2004, collecting samples of the comet to return to Earth. The newest comet mission is Rosetta it will land on a comet named Churyumov-Gerasimenko!Now scientists have identified a class of comets known as small comets though they originally were just called snowballs from space!. The Sun's power about 386 billion billion megaWatts is produced by nuclear fusion reactions. Each second about 700,000,000 tons of hydrogen are converted to about 695,000,000 tons of helium and 5,000,000 tons (=3.86e33 ergs) of energy in the form of gamma rays. As it travels out toward the surface, the energy is continuously absorbed and re-emitted at lower and lower temperatures so that by the time it reaches the surface, it is primarily visible light. For the last 20% of the way to the surface the energy is carried more by convection than by radiation. The surface of the Sun, called the photosphere, is at a temperature of about 5800 K. Sunspots are "cool" regions, only 3800 K ,they look dark only by comparison with the surrounding regions. Sunspots can be very large, as much as 50,000 km in diameter. Sunspots are caused by complicated and not very well understood interactions with the Sun's magnetic field. The highly rarefied region above the chromosphere, called the corona, extends millions of kilometers into space but is visible only during a total solar eclipse left. Temperatures in the corona are over 1,000,000 K.
The Sun's magnetic field is very strong by terrestrial standards and very complicated. Its magnetosphere also known as the heliosphere extends well beyond Pluto. In addition to heat and light, the Sun also emits a low density stream of charged particles mostly electrons and protons known as the solar wind which propagates throughout the solar system at about 450 km/sec. The solar wind and the much higher energy particles ejected by solar flares can have dramatic effects on the Earth ranging from power line surges to radio interference to the beautiful aurora borealis. Further study of the solar wind will be done by the recently launched Wind, ACE and SOHO spacecraft from the dynamically stable vantage point directly between the Earth and the Sun about 1.6 million km from Earth.The solar wind has large effects on the tails of comets and even has measurable effects on the trajectories of spacecraft.